Here is the scenario. The C Suite says it wants “digital transformation". Your company has an older supply chain planning (SCP) system of record (SOR) like SAP APO that was developed in the 1990s. You may have added some best-of-breed add-ons for specialized applications such as multi-echelon inventory optimization (MEIO). But it’s clear that this platform is not getting you what you want: a “next generation”, “low touch”, and “not stapled together” planning platform. This blog and the complete document (available for download) describes goals, technologies and approaches for getting there. While exploring a new approach to planning, a good place to start is with a tool familiar to many people, the Gartner five stage SCP maturity model. Stage 4 brings an extended, external view of the supply chain with profit-oriented optimization. It is an “outside in” mindset, as depicted by the Y axis in the above image. Stage 5 offers a multi-enterprise network view supported by orchestrated planning and execution convergence. It targets service, as depicted by the X axis. This model has withstood the test of time in depicting what highly evolved planning looks like. The difference is that until recently, stage 5 maturity was so unattainable that one Gartner analyst called those that reach it “unicorns”. The vision hasn’t changed dramatically, but the ability to get there has. The transition to these more mature stages, as well as the evolution over the past two decades, has been to shift from a focus on supply to demand. At lower stages of maturity, supply chain planning sought to answer "What and how much are we going to supply or replenish?" As supply chains matured, they shifted to a "demand-driven supply chain", where an “outside in” view started with the demand signal. Decisions were driven by customer wants and needs. But at the highest maturity levels, the focus shifts again – from demand-driven to a "service-driven supply chain". The demand forecast is only an intermediate step towards the end goal of delivering service efficiently to the end customer. In other words, a demand-driven supply chain matches supply to the demand forecast, but a service-driven supply chain focuses on achieving a target service level byhedging against demand variability and supply uncertainty via optimal inventories. 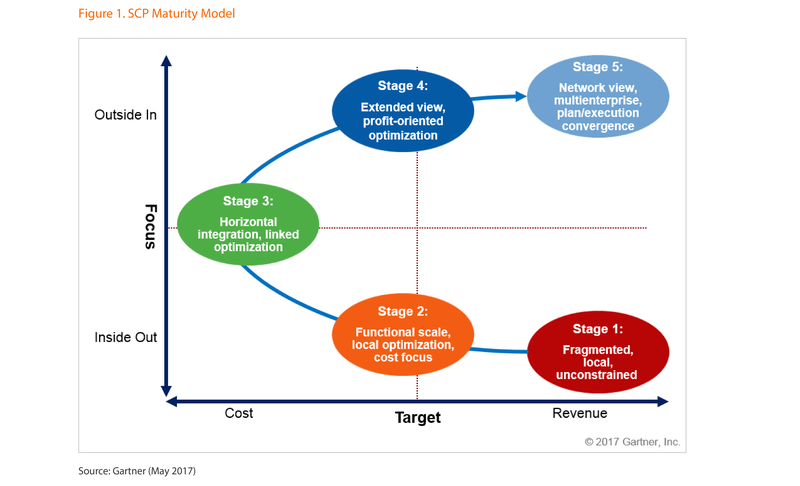 At lower levels of maturity, you plan and execute, and then check your service level outcomes, searching for outcomes. But this trial and error is less compatible with the responsiveness expected in the market. In this highest maturity level, the paradigm is flipped. You plan your supply chain to guarantee your service level outcomes. These Stage 4 and Stage 5 goals are now being addressed by a new approach to supply chain planning that some call “Connected Planning”. This approach is multi-enterprise, service-driven and optimized for profit. It starts with horizontal alignment, connecting Demand and Inventory Planning with downstream demand sensing and upstream factory and Manufacturing Execution Systems (MES). It joins functional silos to create visibility across and beyond the enterprise, making planning more real time, agile and responsive. While the concept of this connectivity has been around a while, new scalable technologies are making it more realistic. The most important horizontal alignment for many companies is sensing demand to improve short term forecast accuracy and resiliency of the longer term plan. Companies are looking for cause and effect in downstream data, asking “What data is out there? How can we take advantage of it?” Weather. Social sensing (e.g., Facebook, Twitter). Consumer sentiment. Macroeconomics. Demographics. All are potential early demand signals. For instance, a hearing aid company sees correlations between in-store shopper behavior and purchasing patterns. An agricultural company looks at on-line social media discussions between farmers for crops issues that could impact demand for their horticultural products. Consumer goods companies are making investments “from the shelf back”, connecting data in ways that they hadn’t before. On the supply side, there is increased activity in scheduling and MES and sensors on the shop floor. Right now most of this newly added data collection is being used only in the factories. But it’s clear that in the future, feedback from the factory floor will be incorporated as supply signals in the planning process. This data visibility across multiple suppliers is also one of the underlying principles of “Industry 4.0”.